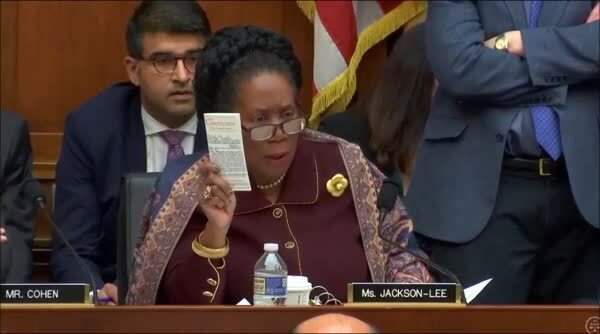 Acting Attorney General Whitaker was castigated by Rep. Sheila Jackson Lee for his non-responsive answers and trolling attitude during her question period in the House Judiciary Hearing on oversight of the Justice Department. Earlier in the hearing, Whitaker acted like a new pledge to the Delta Tau Chi sorority house instead of the acting AG. Chairman Nadler was not amused. Rep. Lee started off by saying she wanted yes or no answers since her time was short. When she asked if he had ever been in a confirmation hearing and if he had appeared at an oversight hearing, "yes or no?" She repeated, "Yes or no?" Instead of responding to her simple question, he began to tell her who he was and she interrupted him, "Yes or no?" "Have you appeared in an oversight hearing in the Congress?" she asked. Whitaker did not comply and Chairman Nadler with gavel in hand told Whitaker to answer the question as asked. Off- camera, a Republican committee member complained that he should be allowed to answer however he felt and not be limited by yes or no. The punished little boy sheepishly replied he had never appeared before Congress for any hearing. No wonder Trump picked him. He's another version of a Dan Bongino, an unserious jackass that believes owning the libs is preferable than actually being a responsible government official, and to act accordingly.